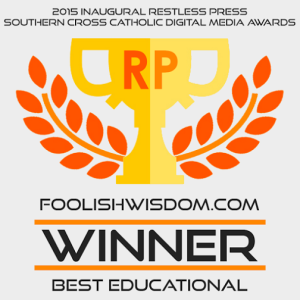 « Catholic or Protestant…Does it Matter? I was reading a small devotional book the other day and in the section on eternity it stated that those who have done their best in life will be “rewarded” with heaven, and those who have disregarded God’s laws would be “condemned” to hell. 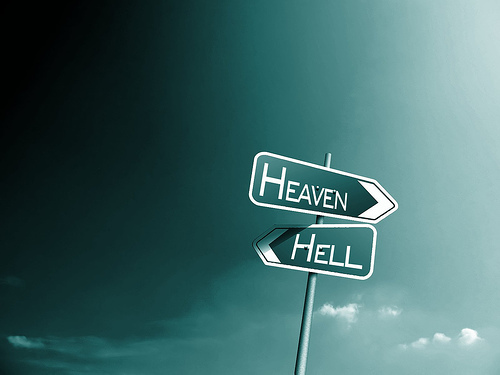 That is of course the most basic way to explain these destinations, the good go to heaven and the bad go to hell. I have no problem with belief in either place, the founder of Christianity spoke at great length about both so to disregard them is to really disregard the faith in general. However, I fear this simplistic way of describing eternity is sticking around far too long in the faiths of those who haven’t been to Sunday School for many years. It also makes belief in eternity seem even less believable to those who profess no faith. When we use these terms of reward and punishment, skeptical modern man easily conceives of God as some great police officer and humanity as no more than a bunch of individuals perpetually ‘on parole’, walking a fine line between eternal happiness and eternal misery. Under the gaze of this all-consuming being we can respond like good children appearing to follow all the rules, or, we eventually fall too many times and begin to believe that nothing we do will be good enough for the all perfect judge. Understandably a God like this is not going to rate very highly. Even for the believer there has to be more to faith than acting a certain way in order to be rewarded with heaven. Thankfully humanity is greater than a pack of trained dogs and eternity more than the bone that inspires us one way or the other. In its simplest, heaven is the eternal state of existence for those who choose to be in relationship with God and hell is the eternal state of existence for those who choose to separate themselves from God. Contrary to popular belief, God sends no one to hell, individuals send themselves to ‘hell’ by living a life that is contrary in every way to truth, beauty and goodness. It might be said similarly that God sends no one to heaven, that is, God does not force anyone into an eternity with him, an individual chooses ‘heaven’ by living a life that responds correctly to truth, beauty and goodness. At our death, the judgement we receive is actually the moment when for the first time we see perfectly clearly who we are and it is that reality that points us to our eternal destination. God is goodness and those who respond to goodness as best they know are responding to God. Edith Stein, a Jewish intellectual who became a Christian and Carmelite Nun before being killed by the Nazis in World War II said rather beautifully, “All those who seek truth, seek God, whether this is clear to them or not”. In other words God is truth himself and one cannot participate in truth without participating in some aspect of God. It is why as human persons we pursue truth at all costs, created in the image of the one who is truth our entire beings seek it out. In fact our whole lives are really an ongoing struggle between truth and untruth. Some truths we find easy to accept, that two and two equals four. Other truths we will struggle with our whole life. God observes this struggle and cheers us on, offering us all the assistance that we are willing to accept but we must choose freely as it is only in freedom that we can truly love. Heaven then is more an invitation than a destination, it is an invitation to walk in the ways of righteousness and those ways begin now, in this this life. The Eastern Christians especially call the process ‘divinization’, that is, our life of heaven or hell begins on earth. Where we end up in eternity is merely a continuation of the life we have lived in time.